Nacho de Paz (Oviedo, 1974) is specially renowned for his commitment to the music of XXth and XXIst centuries. His work with experimental and new creation repertoire is a reference in Spain. Trained in the Russian piano school (with Natalia Mazoun, Ilya Goldfarb, Tsiala Kvernadze), he holds a master’s degree in Piano from Conservatorio Superior del Principado de Asturias and a master’s degree in Composition from Conservatorio Superior Municipal de Barcelona achieving First-class honours. He has also followed doctorate studies in Art History and Musicology at Universitat Autónoma de Barcelona and Universidad Complutense de Madrid. He has been awarded the international composition prizes Joan Guinjoan (2002), Luigi Russolo (2003) and SGAE of electroacoustics (2004). He got specialized in Orchestral Conducting with Arturo Tamayo and Pierre Boulez. 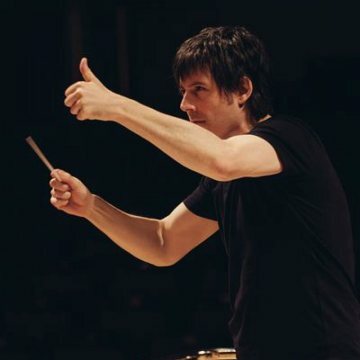 Chosen as conductor by Ensemble Modern, he received a scholarship from the German Government and did a Master in Contemporary Music at the University for Music and Performing Arts of Frankfurt am Main (2006). He has conducted nearly 300 world premieres as well as first performances in Spain of milestone works such as Luigi Nono’s “Prometeo” and Karlheinz Stockhausen’s “Gruppen”. 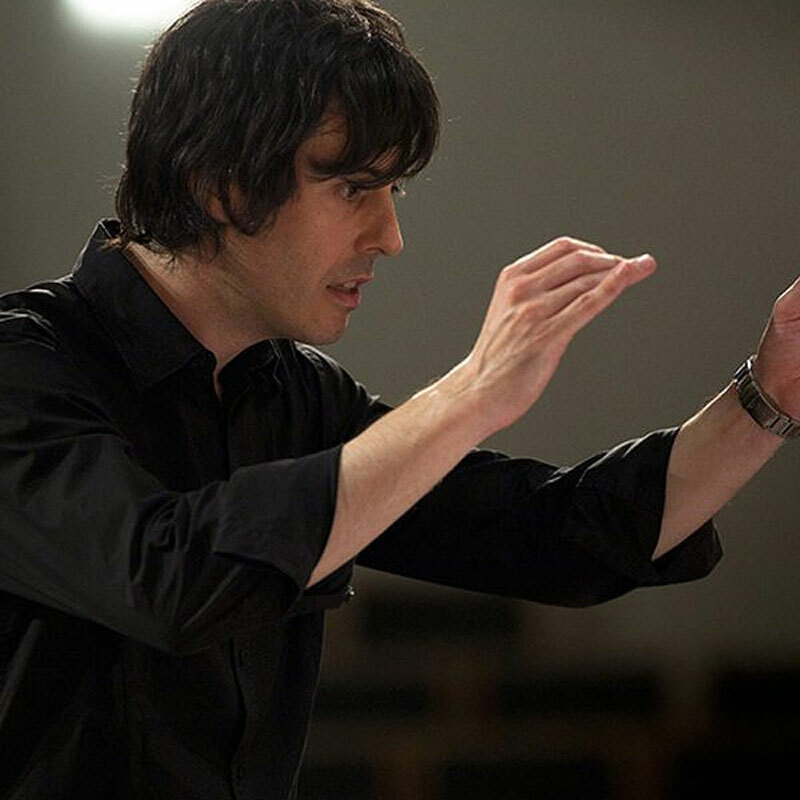 He has conducted Orquesta y Coro Nacionales de España, Orquesta Sinfónica de Madrid (Teatro Real), Orquesta de la Comunidad de Madrid, Joven Orquesta Nacional de España, Orquestra Simfònica de Barcelona i Nacional de Catalunya, Orquesta Sinfónica de Euskadi, Orquesta Sinfónica de Bilbao, Orquesta Sinfónica de Castilla y León, Real Filharmonía de Galicia, Oviedo Filarmonía, Orquesta del Teatro Nacional Sao Carlos de Lisboa, Orchestre Philarmonique du Luxembourg, Netherlands Radio Symphony Orchestra, Ensemble Modern (Frankfurt), Ensemble musikFabrik (Köln), Klangforum Wien, Neue Vocalsolisten Stuttgart, Ensemble PHACE (Viena) and the choir Accentus (París), among others. He has recorded for labels and television stations like ZDF, Hessischer Rundfunk, ORF-1, TVE, Timpani Records, Claves, Verso-BBVA, Label OCNE, NEOS, Stradivarius and Col Legno. Recent and upcoming projects include collaborations with Teatro Real, Teatro de la Zarzuela, Wiener Konzerthaus, RTVE, Real Orquesta Sinfónica de Sevilla, Orquesta Sinfónica de Bilbao, Aspekte Festival Salzburg, Elbphilharmonie Hamburg, Sampler Sèries Barcelona and Orquesta y Coro Nacionales de España.